In today’s online world there are countless ways to generate a passive income and thousands of people are doing it. You have probably heard stories of people making money while they sleep, or maybe even know somebody who does this. Yes, it is possible to generate a passive income stream but the process to creating one is difficult and can be very time consuming. To create an online passive income stream you have to be self-disciplined and be ready to put in 70-to-100 hour-long work weeks starting out. It takes a lot of hard work and time in the beginning but if you’re one of the few who follows through and sticks with it you’ll reap the rewards. Once you get a website all set-up and running, have great content on it, and built up an audience — your site will only require minimal maintenance at this point and you’ll have generated a passive income! The only way you’re going to be able to generate a passive income is by connecting with your audience. If you pick a topic because it’s popular but not something you’re passionate about, your audience can sense that. If you’re creating content with the intent to make money, it’ll become obvious to your audience that that’s your intent. You can’t create a bunch of quality content overnight, nor will you build an audience overnight. It takes a lot of time to create a decent amount of quality content. A lot of trial and error will go into designing the layout of your website. It will take even more time to build the most crucial part to your success — your audience. If you think that once you’ve created your content or product you’ll no longer need to put any more work into it, you’re wrong! Although, the work will be very minimal compared to when you first started, you’ll still have to maintain your passive income source. Once you decided what your niche is, you’ve decided what your market is. Your niche should not be too broad a topic. It should be something you’re good at, something you enjoy, and something you’re familiar with. The amount of money you make will depend on the quality of the content you deliver to your audience. If your audience finds your content rich and meaningful they’ll continue to come back. Your niche is your market, so you don’t want to pick something you’ll get bored with down the road. Otherwise, all the hours of hard work you put in at the beginning will have been a waste. Do not pick a niche just because it’s popular, if you do, you’ll have a difficult time writing content or coming up with new products for that topic in the future. There is a very good chance that the niche market you choose is already being served by other websites or blogs. If that’s the case don’t become discouraged, that just means there’s demand in that market. Instead study what others in your market are already offering. Then you’ll start to figure out where there is a void or gap in that market. Once you discover that void or gap, fill it! The online community offers many different platforms to share your content or product. Will you use a blog? A YouTube channel? A podcast? Or maybe a combination of each? Each platform offers advantages and disadvantages, you’ll have to decide which form will best suit you and your audience. You’ll win your initial fans and audience by the way you style and personalize the content you present. You’ll want to gain the trust of your audience by creating content that has value and expresses your expertise. No one will pay for a service you offer before proving your credibility. Establishing credibility with your audience and creating valuable content for them will insure long-term passive income. At this point, you have grown your audience, they find you trust worthy, and they value your opinions and advice. Now, at this point you can start creating passive income. 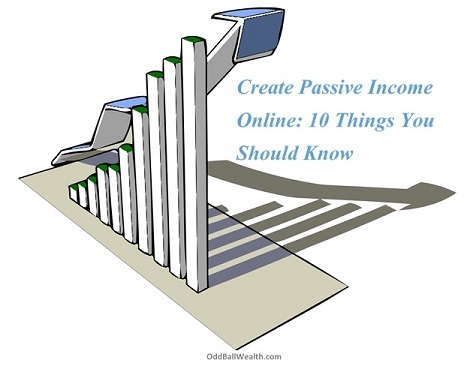 There are many ways to create passive income, such as writing an eBook or creating an online course. You could promote other companies products or services and earn commissions through affiliate marketing. You could also build an online community and charge a member fee. The possibilities on ways to create a passive income are endless. When you get to the point where you have a large audience, established trust, and have generated a steady flow of passive income — there will be times when temptations to make a quick profit come about, by either misleading your audience or offering them products or services that do not offer them value. Resist these temptations! If you don’t, all the credibility and trust you’ve worked so hard to build with your audience could be destroyed instantly and along with it your passive income.